Note: Do not combine the FM Data Update X 2019 with other updates on double players & hangers. 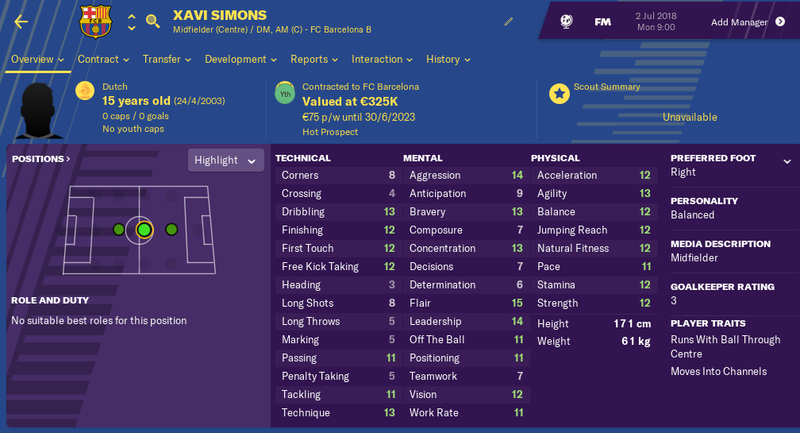 [FM﻿19] Transfers & Data Update FM Date Update X 2019 V9 Fully Clean 19.3 Update! View p﻿a﻿ge 1 message number 1 ﻿for instructions ( Download link ) see message number ﻿2 for the new adjust﻿men﻿t﻿s!﻿!﻿! Fully 19.3.4 clean update! Demonstrated in the editor that the update has been completely re-created based on the 19.3.2 patch of Sports Interactive no database copy of the older 19.1 patch! no old data from the previous one. The First ( Transfer ) Data Update for Football Manager 2019 in Europe based on 19.3 (5 march ) The database V9 has been completely rebuilt at 19.3.4. Official club and league names (FCP -> FC Porto, Euro Cup -> UEFA Europa League and of course the Champions League & Youth League license !! Database errors corrected from the American competition to the Dutch and of course the top competitions! Media resources exclusive: FoxSports, Ziggo, AD, Telegraaf, de Gelderlander, Ajax showtime, VI, Sporza, Voetbalzone, Gazet of Antwerp ,Mundo Deportivo, La Gazzetta dello Sport, Tuttosport and 15 others present in new update! License Fix: Andrés Iniesta (Vissel Kobe), Lukas Podolski (Vissel Kobe), Fernando Torres (Sagan Tosu) Raúl González Blanco trainer (Real Madrid) added to the database. 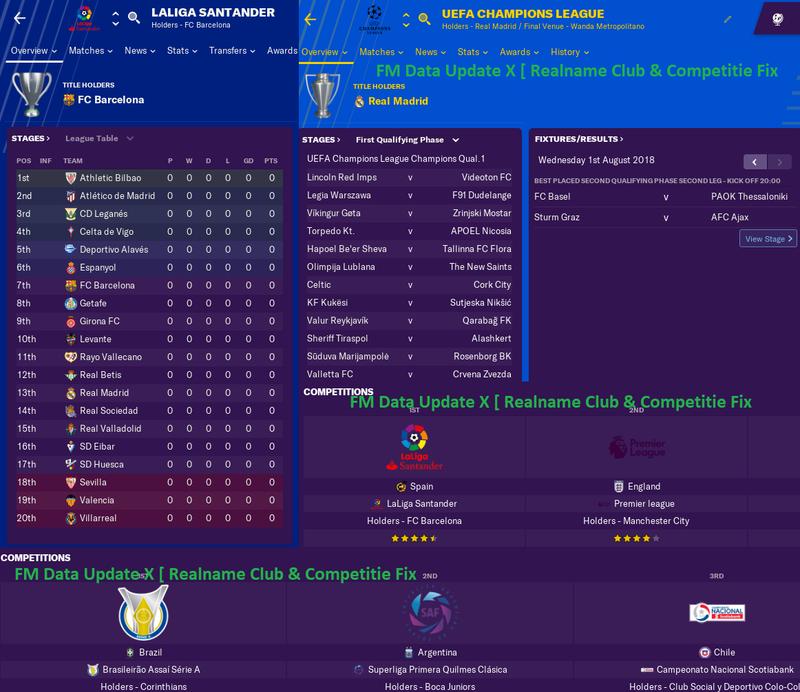 General Changes : Corrected Awards and Trophy names , Updated team captains, vice captains , Promotion / relegation to leagues that have already finished the season. V1 General Changes: 2-11-2018: * ---> Not all changes are shown in the list just a short overview. Collaborations clubs correctly in all competition example: Ajax and Sparta work together youth. Volendam has been removed as a partner. Per Schuurs now has a white skin color in the 3d match. Ronald de Boer added youth coach Ajax U19. Kik Pierie ( SC Heerenveen ) 2nd nationality US. Heracles Inside TV , Mundo Deportivo , NOS Studio Voetbal , De Tafel van Kees 4 others present in new update! Orlando City's affiliation with Wolfsburg. Martin O'Neill, Roy Keane, Seamus McDonagh & Steve Guppy left Ireland's national team --> Mick McCarthy added bondcoach Ireland. Gregg Berhalter new USA's national team manager first team. Marius Stankevicius added manager ( Crema 1908 )--> Massimiliano Bressan removed. Sam Ricketts transferred to Shrewsbury Town, Staff role changed to Manager (First Team). Brandley Kuwas is now the current international of Curaçao. Brett Trowbridge ( Bristol ) retired. Anders Egholm ( SönderjyskE ) retired. Ryan Semple has joined Manchester City has a role as Youth Coach. Joe Cole ex Chelsea retired (Tampa Bay Rowdies )Staff role changed to A.Manager (First Team). Arber Zeneli ( Heereveen ) CA + PA + , added 1 year club option in the contract. Geoffrey Moncada ( AS Monaco - Scout )Transferred to AC Milan, Staff role changed to Chief Scout. & --> Veronica Inside ( Johan Derksen , Rene van de Gijp , Wilfred Genee ) De Tafel van Kees ( Kees Jansma , Kenneth Perez ) many more...!! LA Galaxy's stadium ( StubHub Center ) renamed to --> Dignity Health Sports Park. Eintracht Frankfurt stadium ( Stadion Frankfurt ) renamed to --> Commerzbank-Arena. (KV Westhoek ) stadium name changed Belgian amateur club --> Crack stadion. Hernán Crespo transferred to Banfield Manager (First Team). Rini Coolen (Rosenborg BK )Staff role changed to Head of Youth Development. Ryan Green ( FC Hereford ) Retired. Frank de Boer ( Atalanta ) now has a role as Manager First Team. Erling Moe ( Molde FK ) now has a role as Manager First Team. Mike Phelan has joined ( Manchester United ) Assistant Manager First Team. Sacked John van 't Schip from his club ( PEC Zwolle ) job. Sacked José Mourinho from his club ( Manchester United ) job. Andreas Isaksson ( Djurgarden ) Retired. Claudio Braga ( FC Dordrecht ) now has a role as Manager First Team. Use of VAR in Champions & Europa League. Transfers and contracts updated to the present -> 31/1/2019. Ahmad Mendes Moreira ( FC Groningen )added club option 2 years + skin tone black & birthplace Schiedam. Emiliano Sala ( Cardiff Player ) & Jurri Koolhof ( FC Groningen Scout ) Removed database. Meritan Shabani ( FC Bayern München II ) first nationality corrected --> Germany , added birth place München. Franck Junior Evina ( FC Bayern München II ) first nationality corrected --> Cameroon. Hans Visser (id 201744) is contracted to the wrong club in database. Should be Roda Kerkrade, not Spanish CD Roda--> fixed. Hennie Spijkerman ( FC Groningen ) assistant manager leaves club after the contract. Ki-Jana Hoever ( Liverpool ) added birth place --> Amsterdam , CA & PA Upgrade. Samir Nasri ( West Ham United ) ban removed. Sigi Schmid removed from database. Adelaide United stadium name corrected --> Adelaide Oval. Sydney FC stadium name corrected --> Leichhardt Oval. Angers SCO stadium name corrected --> Stade Raymond-Kopa. Bayern München stadium name corrected --> Allianz Arena. Sint-Truiden VV stadium name corrected --> Staaien --> Stayen. 45+ players position corrected --> ( Diego Laínez Real Betis ,Huseyin Dogan TOP OSS , Vyacheslav Karavaev Vitesse. Jerdy Schouten ( SBV Excelsior ) added birth place --> Spijkenisse , CA & PA Upgrade. Position in the field of players adjusted from the Dutch league to the right position in the field. Stojan Visser ( Ajax ) Created 019 youth coach. Mario Engels ( Roda JC ) Corrected field position --> Striker. Ole Gunnar Solskjær ( Man Utd )Contract expiry set to 30/06/2022, Staff role changed to Manager (First Team). Din Sula (First nationality: Albania, Second: Belgium & Kosova) & City of birth: Brussels +185CM length. Jordy Tutuarima ( De Graafschap ) now has a black skin color in the 3d match , added second nationality Indonesia. Preferred leg changed to the left. Mbwana Ally Samatta ( KRC Genk ) Adjusted is now two-legged , CA & PA Upgrade. Matthieu Louis-Jean Transferred to ( OGC Nice ), Staff role changed to Chief Scout. Eduardo Macià / Scout ( Leicester City )Transferred to ( Girondins Bordeaux ), Staff role changed to Director of Football..
##Agent's FM Data Update X * ---> Not all changes are shown in the list just a short overview. ## Added Players FM Data Update X * ---> Not all changes are shown in the list just a short overview. Brace yourself for the spectacle on 2 December 23.59 in your diary !! FM Data Update X returns with V3 to the highest level ever. The FM Data Update V3 has added: Andres Iniesta, Fernando Torres and Lucas Podolski due to the lack of Japanese licenses in the database of Sports Interactive. In addition, all contracts & transfers are updated to 2/12/2018 including the last staff changes. FM Data Update V3.0 = Online check first post! It makes me proud that nowadays many data updates copy my data data 1 to 1 from the FM Data Update X this says a lot about the popularity of the FM Data Update X worldwide the update of the highest level! ik krijg deze update niet in de game,maar andere updates werken wel..
doe ik iets verkeerds? zet hem in de juiste map dus. Hoi Jeffrey welkom bij de FM Data Update X 2019! Ook mis ik een foto van dat hij in mijn documenten staat en een foto bij starten van een nieuwe save waar je hem kan aanvinken. Op deze manier is maar gissen wat het voor jou zou kunnen zijn. Ik hoor graag van je zo dat ik mee kan denken in een oplossing. Back from the update of the year for Football Manager with version 4! Can your update be used with this file : FM2019 Real Names and German National Team Fix File for FM19 v1.2 [released 07/11/2018] ? 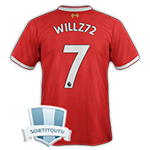 Yes this can be the real name sortitoutsi of being the best FM Data Update X = only data update not real name fix. Hoe is dat probleem opgelost met van der sar? En is er wat te doen aan die verrekte overname van Ajax wat totaal niet realistisch is? Ik krijg veel vragen inderdaad over die overname dit is niet op te lossen helaas dit zit ingebakken in Football Manager sinds de 2018 serie laten we hopen dat het met Football Manager 2020 opgelost is. Hier kan ik niets in veranderen helaas. Dat niet realistisch is ben ik met je eens! Realname Club & Competition LNC FIX is updated! check first post! The Real Name fix is only suitable for Dutch and English language. 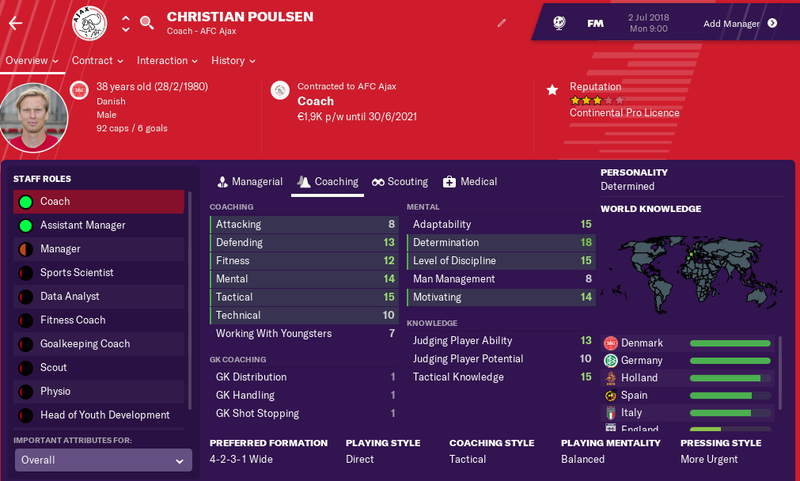 If you want to play in other languages I advise you to download the FM2019 Real Names and German National Team Fix File for FM19 v2.1 by Mons! Suitable for Football Manager 2015,2016,2017,2018 and of course Football Manager 2019! New: Centro Sportivo Alagoano added Brazilian name. New: Scottish Competition names have been updated. New: Brazilian club names license (complete) added. Of course, the rest of the Competition and Club names around the world are included! 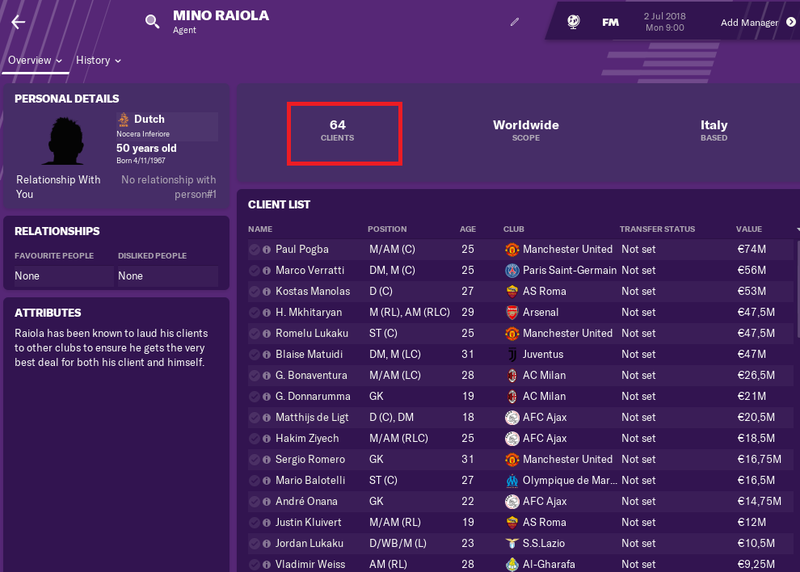 Leading the way for 10 years: the FM Data Update X 2019 16-1-2019 back with a unique experience with realife agents and added (youth) players, media sources, correct market values players. And of course the real RealName Fix Club & Competition of FM Data Update X together form the ultimate duo for an optimal game experience. Are you ready for the great transfers from the winter break? then write the 16-1-2019 at the top of your agenda. The FM Data Update X has stood for 10 years for quality and a clear vision no weekly small updates or special updates especially about a particular player. Each update version that launches FM Data Update X contains a comprehensive database with all transfers from the smallest to the biggest top competitions. Of course also the staff changes and contract grants from players to the medical staff. FM Data Update X Update! The fanatical player wants to start a big update per period and not once a week if there is a mini data update. Therefore, Feb. 2 FM Transfers & Data Update X 2019 launches the latest update for hours of game fun! In the coming days I will update and update the list of the upcoming Final Winterpack v6.1 FM Data Update X 2019! view page 1 message number 2. This section describes the adjustments from V1 to V6.1. As mentioned before 2-2-2019 the full transfer period update will be online. For some reason when I installed the game, it saved it to C. (Windows) \ Games \ Football Manager 2019 \ and i don't even see the dates \ db \ 1910 \ folders. Where do I paste this? How do I download this on a Mac? Any help? View p﻿a﻿ge 1 message number 1 ﻿for instructions ( Download link ) see message number ﻿2 for the new adjust﻿men﻿t﻿s!﻿!﻿! As you have read text yes this is a fresh start based on the 19.3 patch no double/duplicated or old things. Is this a new update or?